The Mid-Atlantic Newspaper Advertising and Marketing Executives (N.A.M.E.) awarded Timothy O. Dellinger, president of Advantage Newspaper Consultants, its highest individual honor—the Honorary Life Membership Award. The award, reserved for the most inspiring leaders who have proven dedicated to the newspaper industry and whose work furthers the mission of Mid-Atlantic N.A.M.E., was presented during the organization’s annual board meeting and sales management conference held April 5 in Spartanburg, South Carolina. Tim has been a member of Mid-Atlantic N.A.M.E. 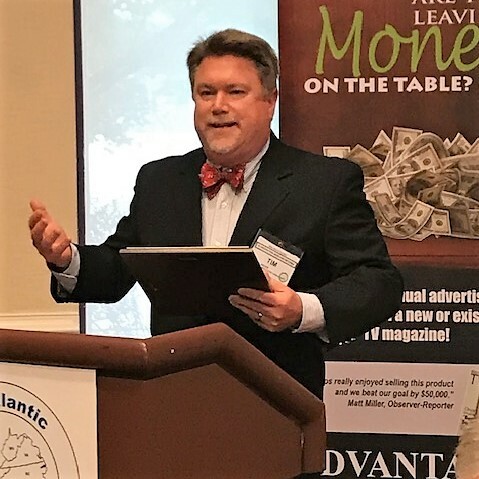 for 28 years and Advantage Newspaper Consultants, an advertising sales and consulting company based in Fayetteville, North Carolina, has sponsored the organization’s sales conferences for nearly two decades. Tim is a native of Durham, NC and graduated with a Bachelor of Science degree in Marketing & Business Administration from the University of North Carolina at Wilmington. He founded Advantage Newspaper Consultants in 1996 and now employs over 20 full-time employees. Tim has always had a strong belief in the power of newspaper advertising, and continues to be one of the industry’s strongest evangelists. Artie Wehenkel, Past President of Mid-Atlantic N.A.M.E. and also an Honorary Life Member, presented the award with Tim’s wife, Jeanne, and son, TJ, in attendance.